The Montreal Canadiens jump from 15th place in the Eastern Conference and 28th overall in 2011-12 to winning the Northeast Division, securing the second seed in their Conference and finishing fourth overall was something that nobody in the hockey world saw coming. Their success in the standings was impressive, but what was equally as impressive – if not more – was having three members of the organization get nominations for hardware at the 2013 NHL awards. Any player, coach or GM will tell you that personal acheivments mean nothing compared to finding success as a team. However, having not one or two, but three potential award winners is a sure sign that Habs GM Marc Bergevin – who is one of the candidates himself – is taking a step in the right direction with this franchise. 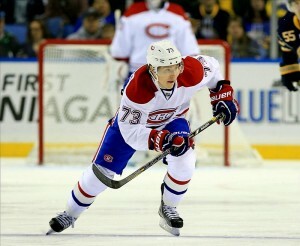 I’m going to take a look at the three members of the Montreal Canadiens who have been recognized by the league for their success in the shortened 2013 season as well as who they are up against to try to give you an idea as to who is likely to find themselves winners at this years NHL awards ceremony. Brendan Gallagher, Montreal’s fiesty rookie forward is up against Brandon Saad of the Chicago Blackhawks and Jonathan Huberdeau of the Florida Panthers for the Calder Trophy which is given to the league’s top rookie. Gallagher finished the season third among rookie scorers with 28 points in 44 games behind Nail Yakupov of the Edmonton Oilers and Jonathan Huberdeau who each tallied 31 points. Gallagher’s 15 goals were second to only Yakupov whose hat-trick in the Oilers final game propelled him to 17. In the plus/minus category, Gallagher was fifth with a +10. Saad finished first with a +17 rating and Huberdeau was a -15. Brandon Saad had the luxury of playing on the league’s top team with a star studded roster that included the likes of Jonathan Toewes, Patrick Kane, Patrick Sharp as well as a one two punch in goal of Corey Crawford and Ray Emery. Huberdeau didn’t have the all star support that Saad enjoyed but was given the oppurtunity to play top six minutes averaging 16:55 minutes of ice time per game, first among rookie forwards who have played at least ten games. Gallagher on the other hand had a team that had plenty of depth but no player even remotely close to the talent that Toewes and company possess. As for time on ice, the Montreal rookie played an average of 13:51 minutes per game, placing him 13th among rookie forwards with at least ten games under their belt. Considering the success he found with the limited time awarded to him, and the success he helped his team acheive, Gallagher should come away as the 2013 Calder trophy winner. The Norris trophy is awarded to the defenseman who demonstrates throughout the season the best all-round ability in that position. There is no surprise that P.K. Subban of the Canadiens was named as one of the three finalists along with Kris Letang of the Pittsburgh Penguins and Ryan Suter of the Minnesota wild. Subban finished the year tied in first for points among blueliners with Kris Letang, each notching 38 points. Suter wasn’t far behind as he tallied 32 points of his own. Subban’s eleven goals were second to only Mike Green’s 12 he scored with the Washington Capitals. Seven of those goals were scored on the powerplay, ranking him second in that category behind fellow Canadien Andrei Markov. Kris Letang’s +16 rating is tops among the three finalists followed by Subban with +12 and Suter with +2. Suter played the toughest minutes as he averaged 27:16 minutes of ice time per game. Letang’s 25:38 minutes per game place him seventh in the league and Subban’s 23:14 minutes put him in 35th place in the NHL. 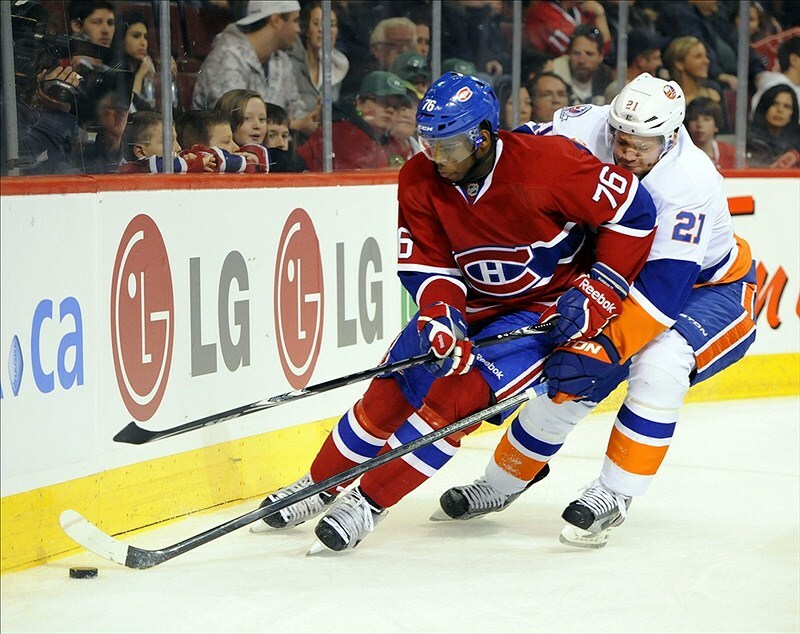 The lack of minutes may be what cost Subban the Norris. It can be viewed as more impressive that Subban put up such good numbers without being on the ice as much as his competition but many feel that his reduced time on ice implies he can’t handle the minutes of a top tier defenseman. Suter never tired and put up quality numbers on a team that failed to make it to the post season. Krist Letang played very respectable minutes and managed as many points as Subban despite playing seven less games. P.K. Subban definitely had a great season but I would be surprised if he took home the Norris Trophy. Suter seems to be the favorite but my money would be on Kris Letang coming out on top. The Jack Adams award is given each year to the league’s top Coach. Michel Therrien lead the Canadiens to the top of the Northeast Division and second place in their Conference just one year after the Habs found themselves in the Eastern Conference and 28th overall. Therrien got the best out of Lars Eller and handled the development of rookies Brendan Gallagher (up for the Calder) and Alex Galchenyuk quite impressively. These are just a few of the reasons that Therrien is nominated for the…..what’s that? Therrien isn’t a finalist for the Jack Adams? Really? Bruce Boudreau and Joel Quenneville of the Anaheim Ducks and Chicago Blackhawks you say? hmmm… Both deserving I guess, much better teams to guide than Therrien had, but what can you do. It’s pretty clear what this award is given out for. What should be just as clear is that Marc Bergevin of the Canadiens will be named the league’s top GM in 2013. Ray Shero of the Pittsburgh Penguins did a heck of a job at the trade deadline when he acquired Jarome Iginla, Brendan Morrow and Douglas Murray without giving up a single roster player. By doing so he made a Stanley Cup competitor out of a team that beforehand was merely just a…Stanley Cup competitor. Bob Murray of the Anaheim Ducks avoided off season stress when he re-signed forwards Corey Perry and Ryan Getzlaf. There’s no question that losing either player would impede the team’s chances of repeating their success from this season (second in the Western Conference) in the near future. Signing Swedish goaltender Viktor Fasth was a move that payed divedends as Fasth posted 15 wins and an impressive .921 save percentage. The signing of Sheldon Souray is nothing to ignore either as the 36 year old defenseman finished with a +19 rating while playing just under 21 minutes per game. When Bergevin hired Michel Therrien as the Montreal Canadiens head coach there were many skeptics. 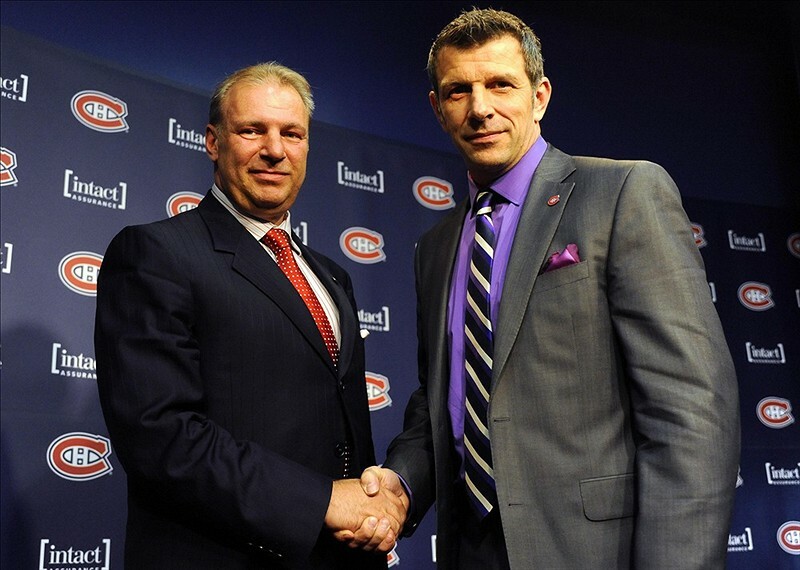 Therrien however, made Bergevin look like a genius as he brought the Habs to the top of their division while at the same time earning a nomination for the Jack Ad….oh wait no, sorry I keep thinking that the NHL’s top coach in 2013 was nominated for the award given out to the league’s top coach. My Bad. Nevertheless, Bergevin proved to be right in his choice. When P.K. Subban held out at the beginning of the season, Bergevin didn’t budge. After missing six games, Subban eventually gave in to Bergevin and signed a two year contract worth $5.75 million, an amount nobody expected the eventual Norris Trophy candidate would accept. Signing Brandon Prust proved to be very beneficial to rookies Brendan Gallagher and Alex Galchenyuk as well as the whole team and he filled the team’s need for a penalty killer and good face off man by bringing Jeff Halpern back to the team late in the season. Many were disappointed in Bergevin’s lack of action of trade deadline day, but made one of the best trades of the year earlier on when he somehow managed to talk Dallas Stars GM at the time Joe Nieuwendyk into taking Erik Cole in return for Michael Ryder and a 3rd round pick in the 2013 NHL entry draft. A straight up swap of Ryder for Cole would have already had Bergevin come out on top of that deal, pulling off a draft pick as well was just a work of art. Having fou.. three members of the Canadiens organization named as finalists for awards this year is enough to give hope to a city that has been losing for too long. Having two out of the three who will more than likey win shows that Bergevin’s goal to return the winning culture to Montreal is one that is very reachable.